The Times of Wirtland: Wirtland's flag under copyright attack? Wirtland's flag under copyright attack? What is more important in modern world: political law or intellectual property law? Since birth of Wirtland in 2008, Wirtland feels politically safe, as nobody questioned our right for sovereignty and independence. But what about intellectual property? To our great surprise, there is someone who wants to challenge our intellectual property rights. Believe or not, this someone says he holds intellectual property rights over... Wirtland's flag! This sounds absurd, but that's exactly what happened this week. 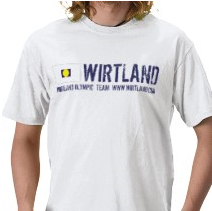 As any community, Wirtland wanted to offer its own official merchandise. We developed several apparel designs, based on our own artwork. Naturally, our designs included Wirtland's flag. Recently we have opened a shop at Zazzle.com. Wirtland's shop initially offered 9 items, including T-shirts, sweaters, caps, bags, with printed or embroidered Wirtland identity images. All clothing is fully customizable: the buyer can remove/replace inscriptions, add own texts, change compositions, adjust colours, to make his garment unique. However, we were surprised to receive a letter from Zazzle, saying: "We have been contacted by the intellectual property right holder and at their request we will be removing your product from Zazzle’s Marketplace due to copyright claims". 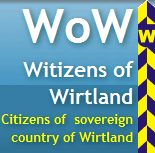 Now, who is that mysterious holder of copyright over the Wirtland's flag? We have not received answer so far. 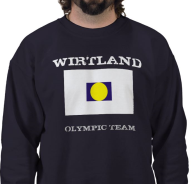 However, two "banned" apparel items - a sweater and a T-shirt (see pictures) with Wirtland's flag - disappeared from our shop, despite our immediate request to abstain from removing our products until clarification of all questions. We hope Zazzle will solve the problem soon, and believe the company must hold responsibility for ungrounded banning our products. We will keep you informed. 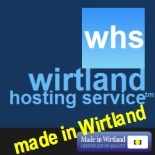 In the meantime, wear your Wirtland flag with pride!